You can manually add your products to EMERGE App if you are not selling on any integrated sales channel. Physical Products are merchandise, apparel, and other physical goods you sell and ship to customers. 3. Fill up the necessary fields and click Save on the top right corner. 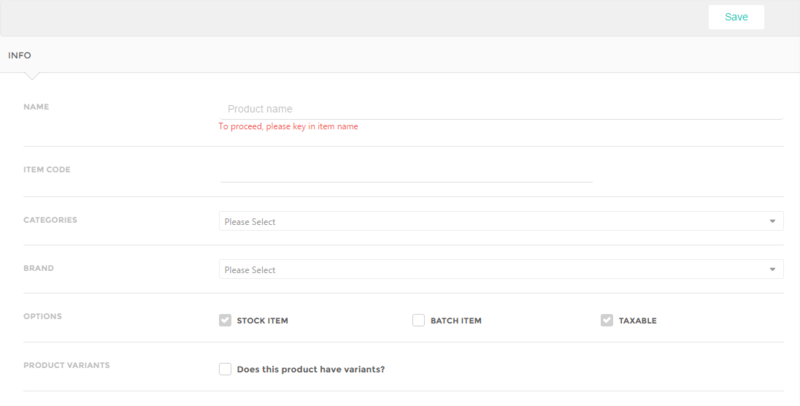 The new product will be displayed on the product listing page.Mandatory fields are marked with ‘*’. Item Code – The unique code of your product, this is usually the SKU number. This code must be unique for every product. Categories – Multiple categories can be assigned to each individual product. Products can be filtered by their categories in the product listing page. Brand – Specify the brand of your product if applicable. Products can be filtered by their brand in the product listing page. Unit of Measurement – Products can be sold in different units. Service products are essentially products with the exclusion of stock inventory. E.g. of services includes air conditioning servicing, hardware installation, computer troubleshooting services…etc Physical Product and Service can co-exist in your Sales Order.